Damon's actually on screen for more than 20 seconds, appearing in a trio of spots, including two with his Monuments Men co-star and fellow Oscar winner George Clooney, a regular in dopey overseas commercials. 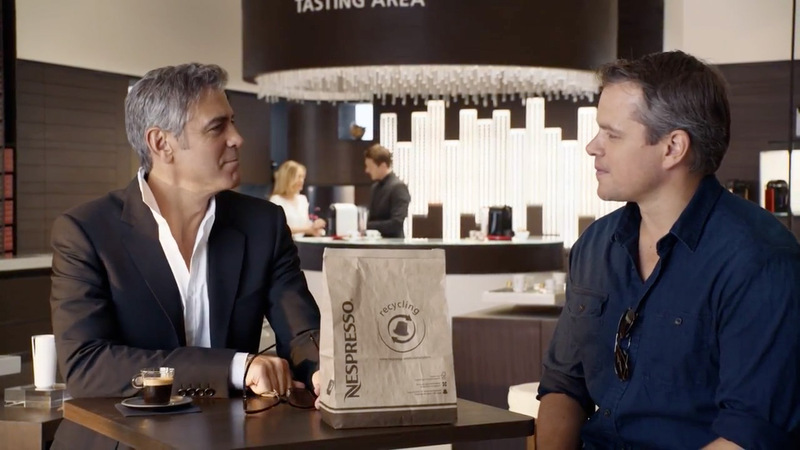 None of these Nespresso ads makes much sense. What's worse, even with the mega-star wattage, they're smug and completely dismissible. In one spot, a woman screams "George Clooney's inside!" to make other women stampede after the actor so she can enjoy her coffee alone. Later, in a bizarre bit of bro humor between aging Hollywood hunks, Cloons pulls the same trick on Matt, but the Damonater escapes by somehow making the star-stuck women move in slow motion. Damon also expresses his affection for the Nespresso mobile app for no particular reason. After watching these antics, I feel like I've bourne a grave injustice.